But, specially for my friends that do get emails from me that start like that, you may want to know what this is about. 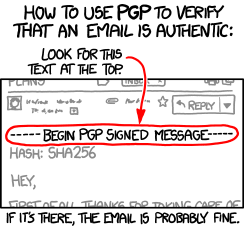 PGP (Pretty Good Privacy) is a standard way to both sign and encrypt emails and other things. You don't have to understand the computing and mathematics behind it, just rest assured that there are people that do. In short, to check the signature, you have to have the right software on your computer (in the mail client, normally) and you have to have the senders key and trust it to be from the real sender. If you start using PGP a bit you'll soon get the hang of it. When I send a signed email I have to use a pass phrase to confirm it is really me. This is somewhat more secure than a signature on a paper document. Encryption is a different matter, and some people get confused and think that a signed email is somehow encrypted. The only way I could send you and encrypted email is if I have your public key which I then use to scramble the email in such a way that only you can read it. You have the other half of the key and usually a pass phrase (a long password which is usually some sort of sentence) which unlocks the key and allows the email to be read. Again, you have to have the right software on your computer to do this, and you have to have your key, and your pass phrase, and I have to have used the right key to send the email to you. So, obviously, don't just do what Randall says here - install PGP on your email client. Check signatures properly. Sign emails if you want. We live in a world of both spooks and data thieves, so taking some precautions may even be sensible. Of course don't lose your keys or passphrase if the law asks. Claiming you forgot is not a valid excuse. I think it is a valid excuse, to be honest. I have a feeling you somehow have to prove it though. Anyone know enough about RIPA to answer that? How do you prove you have crap memory? One way would be to say something very specific at the start of the hearing and when you are trying to prove people are able to forget things, ask the prosecution to repeat what you said... But who knows if that would work. I am sure there are research papers on memory studies that can be used, and expert witnesses, and so on. I use S/MIME rather than PGP/GPG these days; it's more widely supported. Trying out our MP again. 10% of lines are faulty for many ISP? AAISP not one of the "best broadband providers"